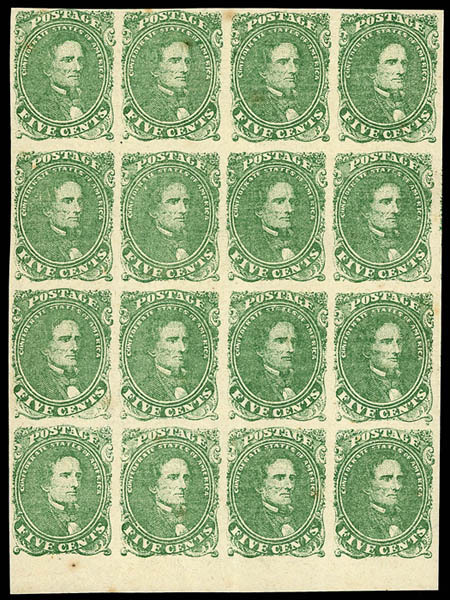 Confederacy, 1861, 5¢ green, block of 16, pos 16-19/26-29/36-39/46-49, bright and fresh, large margins including bottom sheet margin, second stamp tiny thin, without gum, light vertical crease third column, trivial tone spots, fresh and Very Fine block. Scott No. 1; $2,800 as no gum singles Estimate $1,000 - 1,500. 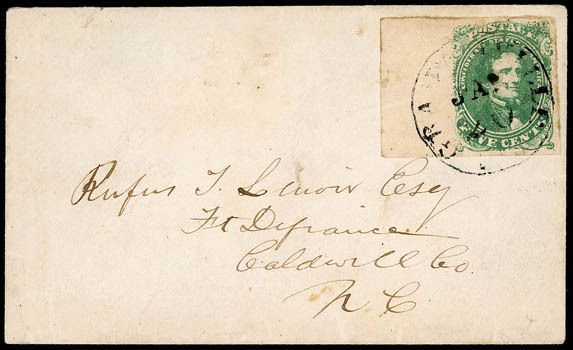 Confederacy, 1861, 5¢ green, horizontal pair, tied by "Prattville, Ala., Jul. 1" First Day of the 10¢ Rate cds on adversity cover made from printed sheet music, addressed to Lieut. E. A. Smith, or S. W. Allen, Mobile Ala., folded open for display, Very Fine, ex-Dr. Howard Green. Scott No. 1 Estimate $1,000 - 1,500. AN ATTRACTIVE FIRST DAY OF THE 10¢ RATE USAGE ON AN ADVERSITY COVER MADE FROM PRINTED SHEET MUSIC. 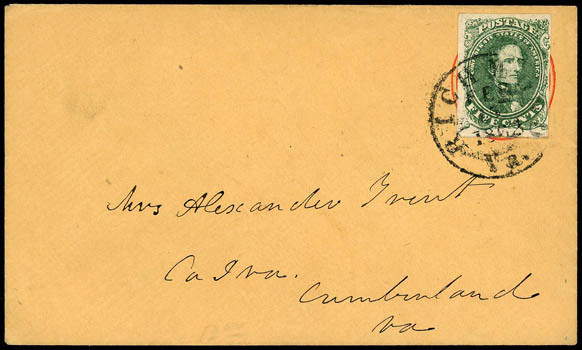 Confederacy, 1861, 5¢ green, three large margins, tied by neat "Macon Ga" double-circle datestamp on gray wallpaper cover from the Manigault correspondence to Augusta Ga., Very Fine. Scott No. 1; $1,500 Estimate $500 - 750. 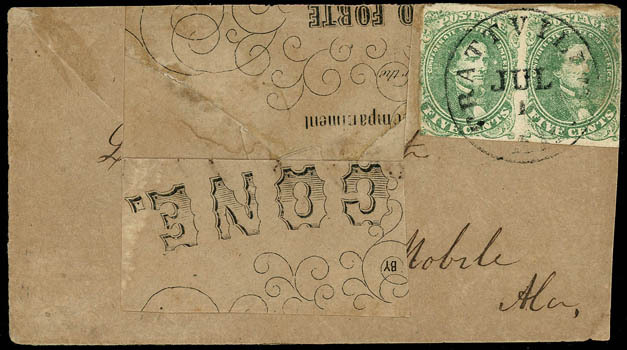 Confederacy, 1861, 5¢ green, four huge margins all around including left sheet margin, tied by "Grahamville S.C., Jan 20" on cover to Fort Defiance, Caldwell Co., N.C., pencil postscript note on inside of flap "20th, All quiet, Probably a mistake about the arrival of the Burnside Expedition", Extremely Fine and choice, ex-Kohn. A GEM USE OF THE 5¢ GREEN 1861 ISSUE. 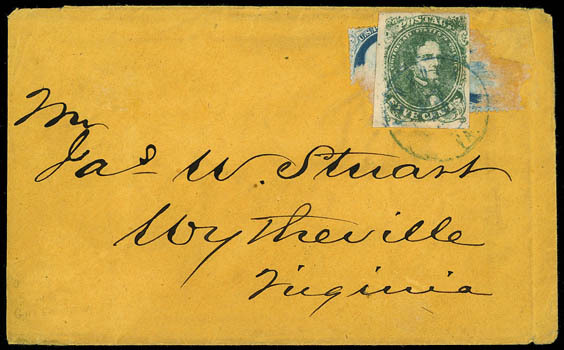 Confederacy, 1861, 5¢ green, ample to large margins, tied by neat blue "Norfolk, Va." cds on cover used prior to the war initially franked with two U.S. 1857 1¢ blue issues, stamps mostly removed below the Confederate use, addressed to "Mr. Jas W. Stuart, Wytheville, Virginia", Very Fine and an unusual double use adversity cover, ex-Tate; with R. Weill backstamp. Scott No. 1 Estimate $400 - 600. 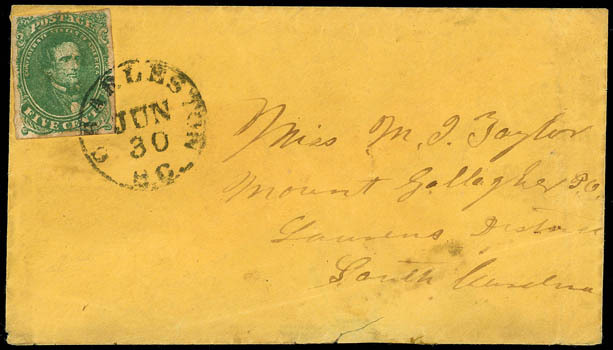 Confederacy, 1861, 5¢ green, margins to just touched at top, minor gum toning, tied by neat "Charleston, S.C., Jun 30" cds (type 5) on circa 1862 orange buff cover to Mount Gallagher S.C.; small edge tear and faulty flap, F.-V.F. THIS WAS THE LAST DAY OF THE 5¢ RATE FOR UNDER 500 MILES. Confederacy, 1861, 5¢ green, in combination with 1862, 5¢ blue, Archer & Daly printing, tied together by "Richmond, Va." cds on homemade cover to Isaac Leftwick Esq. in Wytheville, Va.; light cover tone spots, F.-V.F., a scarce and seldom seen combination. Scott No. 1+7 Estimate $300 - 400. Confederacy, 1861, 5¢ green, position 42, large margins except clear at right, tied by "Richmond Va., Feb 15, 1862" cds over indicia of 3¢ red (U10) buff Nesbitt entire to Cumberland Va.; flap flaws, Very Fine and choice adversity use. 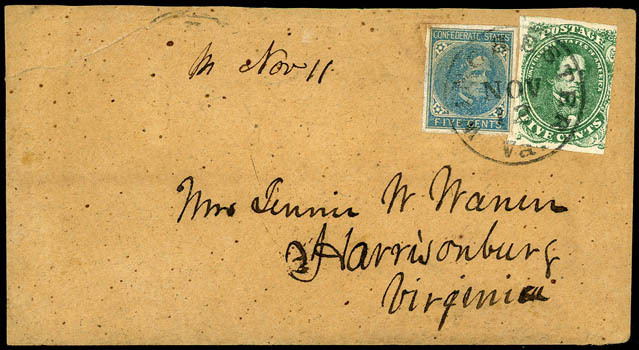 Confederacy, 1861, 5¢ green, three large margins, just in at right, used with 5c blue (7), large margins, tied by "Winchester Va. Nov 12" cds on brown homemade cover to Harrisonburg Va.; upper left corner of cover skillfully mended, otherwise Very Fine, scarce combination franking, otherwise Very Fine and scarce combination franking, ex-Kohn, Brandon. 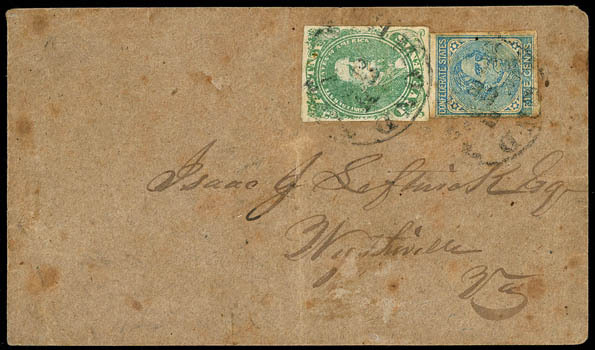 Confederacy, 1861, 5¢ green, left margin single, tied by blue "Petersburg, Va., 5 cts" integral rate cds on blue embossed R.A. Young & Bro. 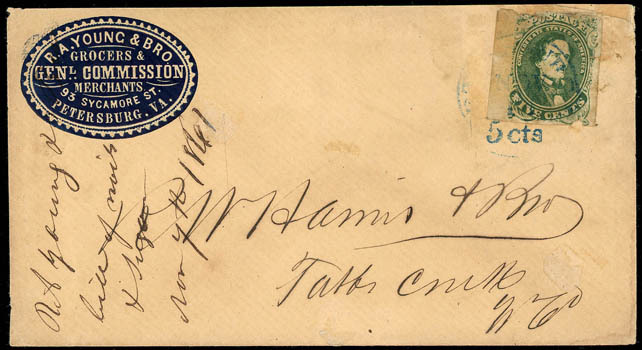 merchant cameo corner card cover, 1861 docketing at left; stamp flaws, F.-V.F. Scott No. 1 Estimate $200 - 300.